Who, exactly, is Nikki Haley? With just weeks left in her role as the ambassador to the United Nations, I wanted to ask her one of the big questions naturally prompted by her departure: Does she share Donald Trump’s iconoclastic, transactional, über-nationalist vision of America’s role in the world? “I get where he wants to go, and I just have my different style of getting us there,” Haley told me when we met in Washington, D.C., on Wednesday. Over the course of our conversation, on the morning of George H. W. Bush’s state funeral, she made the case for a values-driven U.S. foreign policy—albeit one that she herself has selectively applied—with hard-nosed diplomacy at its center. She highlighted the value of Trump’s bluster about attacking North Korea, even as she told me that “diplomacy is always the right option, because war is never a good option.” She recognized Saudi Arabia as a vital partner against Iran, but insisted that Riyadh can’t be given “a pass” for the murder of the journalist Jamal Khashoggi, pointedly noting that the Saudi crown prince’s “government did this, and so he technically is responsible.” And Haley, who has announced her resignation but won’t leave her post until the end of the year, acknowledged daylight between her and the president. A 46-year-old, exceedingly popular Republican politician, Haley is the daughter of Indian immigrants and a former South Carolina governor who is often discussed as a potential presidential candidate. Her reflection on her tenure at the UN, and the moral calling that she felt underpinned it, was a vivid reminder that the president’s America First vision isn’t necessarily the settled future of the Grand Old Party. It was also an object lesson in how Haley, perhaps more skillfully than any other top administration official, has navigated major differences with Trump while cultivating common ground. And she’s done it representing him at an organization he once denounced as no friend to the United States. Asked about accountability for Saudi Crown Prince Mohammed bin Salman, who, at least according to senators briefed by the CIA this week, was likely behind the hit, Haley said, “I think all of that, the administration needs to decide.” She did not specify the additional steps she would like the White House to take. But while Trump, Secretary of State Mike Pompeo, and Defense Secretary Jim Mattis have avoided calling out MbS, as the crown prince is known, citing a lack of clear proof of his complicity in the extrajudicial killing, Haley didn’t reference the intelligence community’s findings or lack thereof. Instead, she simply noted bin Salman’s status as the kingdom’s de facto ruler to make the point that the buck stops with him. “We can’t condone [the Khashoggi murder], we can’t ever say it’s OK, we can’t ever support thuggish behavior, and we have to say that,” Haley told me. As Haley sees it, whenever people feel stripped of freedom and opportunity, they instinctively challenge their government in order to reclaim control over their lives. 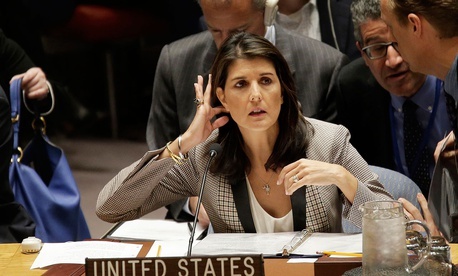 “And if a government doesn’t value human life,” she said, “then they will do something to their people that the whole world will have to pay attention to.” Haley has argued that the peril extends beyond those under the dictator’s thumb. In 2017, after a North Korean missile test, she drew a direct connection between the nuclear threat from Pyongyang and the government’s ghastly human-rights record. “Depravity toward one is a sure sign of willingness to do much more harm,” she warned at the time. These views, she told me, have informed the tough line she’s repeatedly taken at the United Nations on Russia’s aggression against Ukraine, support for Bashar al-Assad’s war crimes in Syria, and suspected nerve-agent attack against a former Russian spy in the United Kingdom. Still, while Haley presented a rather conventional view of America’s role in the world—one of supporting allies, confronting dictators, and making the world more secure—she punctuated it with arguments for upending certain conventions of U.S. foreign policy. Haley credited Trump’s fiery threats of military action against North Korea and its Little Rocket Man leader in the summer and fall of 2017 with helping her achieve arguably her greatest success at the UN: the passage of three rounds of unprecedentedly severe Security Council sanctions at a moment of acute crisis, when North Korea was testing nuclear bombs and missiles that could reach the United States. The sanctions helped cut off funding for the North’s nuclear-weapons program and pressure Kim Jong Un into (still very tentative) nuclear negotiations. To shepherd the measures through the council, she needed the support of Russia and China, both of which have served as North Korea’s protectors. Before the first sanctions resolution, Haley recalled, she tried to look at the issue from China’s perspective. Leaning forward on the couch as she relished the memory of the high-stakes negotiations, she said she knew that China didn’t want war on the Korean peninsula or North Koreans streaming across its border. So she argued to the Chinese ambassador that the only way to address their shared concern about North Korea’s missile testing, short of war, was through sanctions on an initially limited set of sectors of the North Korean economy. She then leveraged Chinese support to convince the Russians that it would be a bad look to stand alone in support of Pyongyang. I asked whether she knew at the time what the president was actually going to do. “Yeah, I knew,” she responded. Was the United States really on the verge of initiating a war against North Korea? The North Korea sanctions packages were a clear demonstration to the Trump administration of the benefits of the United Nations. But during Haley’s tenure, the United States has also stressed the international body’s drawbacks, exiting the Paris climate-change agreement and the UN’s cultural organization, refusing to join the new Global Compact on Migration, and withdrawing funding for the UN agency that supports Palestinian refugees (an agency Haley was sympathetic toward early on in her ambassadorship). When I asked her whether, given these actions, she would describe the United Nations as a total mess or just a partial mess, she responded, “Depends on the day. The United Nations has a lot of flaws: the waste and bureaucracy, the anti-Americanism, the Russian veto [as a permanent member of the Security Council]. It’s a very frustrating place. Having said that, we would not have gotten the North Korea sanctions had it not been for the UN. We would not have gotten the arms embargo” on combatants in the conflict in South Sudan, a resolution the U.S. drafted. “Truly no one believes me: I am not even thinking about it,” she said, noting that she went straight from her governorship to the Trump administration. “For the last eight years, seven days a week, I always pick up my phone with a pit in my stomach, worrying that something bad is gonna happen. And I wait for the day when I don’t have to be so scared of my phone.” Of course, a person—particularly one as ambitious as Nikki Haley—can only sleep in late and binge-watch TV for so long.